The Part Time Gourmet: Whipped or Mashed Potatoes? 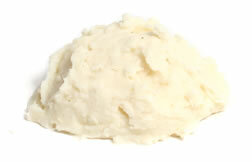 In a special to the Chicago Tribune, James P. DeWan offers up some tips on avoiding a gluey, stiff or lumpy flavorless mess when trying to make Whipped or Mashed potatoes (which for all intents and purposes are the same thing). He recommends using russet potatoes, though any white or yellow potatoes will work ok. You can either bake (in a 425 degree oven) or boil the potatoes until they are tender. If you boil them, leave the skins on and start them in cold water. As always, we control the process. Here, we're adding butter and cream until the potatoes reach the desired consistency. Don't worry about amounts; instead, follow the progress as you add more and more. 1. Pass the hot potatoes through a ricer or food mill (photo 1). This "potato puree" is the basis for many wonderful preparations. If you prefer a lumpier (I mean, more "rustic") final result, use a potato masher instead. 2. Add room temperature (not melted) butter (photo 2) and hot liquid: cream or milk, even stock. Just remember, the richness of your ingredients is passed to your final product. Figure about 1/4 cup each butter and liquid for every pound of potatoes. To be safe, start with half that amount, and be prepared to add more. Then add any other flavoring or seasoning ingredients (see below). 3. Mix until smooth with a spatula. If you're using a stand mixer, use a paddle attachment if you have one and avoid overmixing, as that breaks down the starch, making your potatoes gummy. 1. Be sure to add enough salt: about a teaspoon of kosher salt or 2/3 teaspoon table salt per pound. Most people skimp on salt out of health concerns. Seriously, though, the fury you'll feel over underseasoned potatoes will raise your blood pressure far more than the salt you're trying to avoid. 2. Black pepper, while delicious, creates suspicious black specks in your otherwise pristine product. You may want to use white pepper, or just skip it altogether. 3. Potatoes take very well to other flavors: roasted garlic, avocado, minced rosemary, horseradish, chipotle chilies, wasabi--the list is endless. The amount is your call. One caveat: Make sure any added vegetable is cooked properly. You don't want your silky mash marred by the harsh crunch of a piece of, say, raw onion.